Like a gun-mounted chainsaw ripping its way through a horde of screaming piles of machismo, muscles, and meat, Microsoft has announced that its popular Gears Of War franchise is bursting into the world of feature films. The company made the announcement today at a livestream event for the upcoming Gears Of War 4, which releases to the wider public on October 11. Talking to the press, developer Rod Fergusson told reporters that it was “time” for the transition, which will be aided by a development deal with Universal. 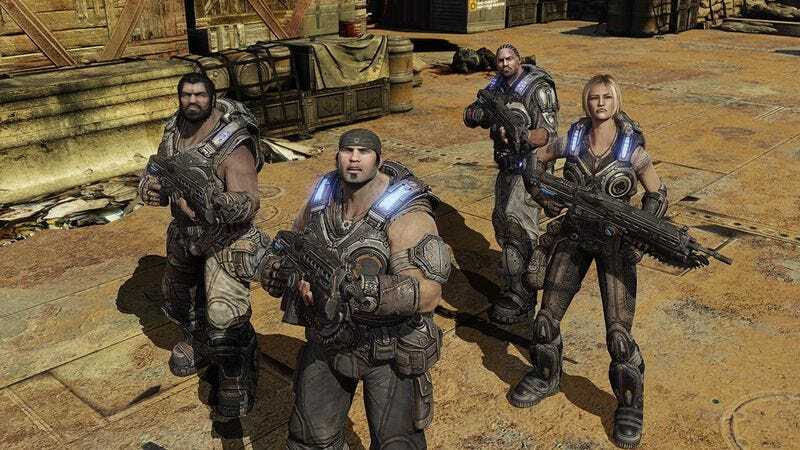 This isn’t the first time Gears has attempted to make the leap to the silver screen; a movie version of the franchise have been in the works since at least 2007, initially with Underworld impresario Len Wiseman at the helm. That project fell through, but now Microsoft and producers Scott Stuber (Ted) and Dylan Clark (Rise Of The Planet Of The Apes) will be shepherding the adaptation into theaters. For those unfamiliar with the franchise, the Gears Of War games center on the war-torn world of Sera, a paradise of thigh-high walls and the grunting, gun-toting musclemen that hide behind them. So far, four games (Gears Of War 1-3 and a prequel, Judgment) have chronicled the fight between tough-talking war hero Marcus Fenix and the rampaging army of lizard men known as the Locust, to the tune of multiple millions in units sold. Microsoft acquired the series back in 2014, placing Fergusson—who produced the first two games in the franchise—at the head of The Coalition, its new development team. Meanwhile, the new film represents Hollywood’s latest Charlie Brown-esque attempt to kick the “video game movie” football being held by an ever-capricious Lucy Van Pelt known as “audience taste.” Similar efforts include The Prince Of Persia, Hitman, and, most recently, Duncan Jones’ disappointing Warcraft film.